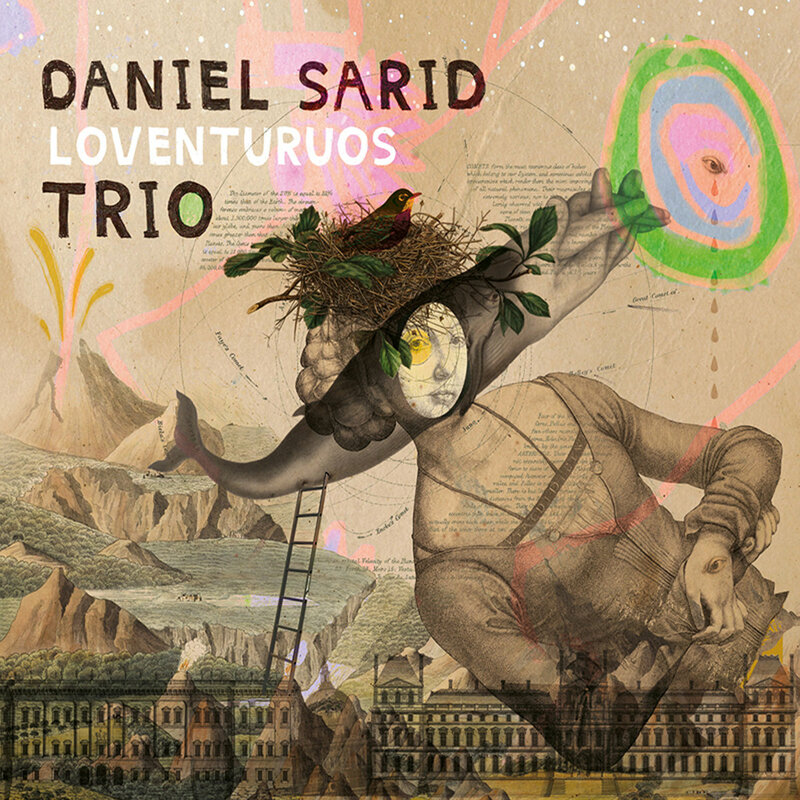 Loventuruos is the latest offering from Israeli pianist/composer Daniel Sarid and his dynamic modern trio. Throughout the album Sarid, along with bassist Gilad Abro and drummer Ziv Ravitz maintain a delicate balancing act, reconciling seemingly contradictory musical forces. These compositions and performances are free and exploratory yet lyrical, abstract but dynamic. Opening up with the title track, the trio immediately comes in on the attack. On top of Abro’s sturdy, melodic bass lines and Ravitz’s propulsive, free drumming, Sarid constructs a spidery web of melodic lines that sporadically weave into stark tonal clusters. Sarid’s choppy, pummeling style recalls Cecil Taylor, the wide open spaces left within each measure occasionally invaded by short, complex bursts of action. “Declaration of Intentions” finds the band’s unique compositional flair, establishing a kind of oddball take on traditional jazz trappings. The tune almost recalls traditional bebop, but inverted, with it’s rhythmic and harmonic conventions stretched and abstracted, reflected through a fun house mirror. After collectively lumbering through a short melodic theme augmented by Sarid’s thick clusters, Ravitz and Abro leap into a furiously paced free Bop groove. Sarid solos with abandon, dropping short lyrical Easter eggs among the chromatic chaos before returning to the main theme. Emerging from a hazy plume of percussion, bass and delicate piano, the lonely and sparse composition “Lighthouse” is strikingly minimal. As the interplay between the three players grows more sure and intense, the piece coalesces into a coherent whole. Ravitz’s drums roll and thunder against Abro’s bass, while Sarid struts and skitters on top. Departing from both bop and free cliches, Loventurous represents a strong marriage of the two traditions. Experimental and free playing is held together by an adept sense of spacing and is augmented by subtle melodic indulgences. It is the harmonious merging of these two forces that the Daniel Sarid Trio wrestles with throughout the album’s eight tracks. This union of opposites leaves the listener with a unique, hybridized sound. Loventurous is strikingly avant-garde yet anchored with sublime traces, it is rhythmic exploration with a pulse, the kind of record made by players who have made it a point to touch on both ends of jazz’s sonic continuum.